What is rainwater harvesting? Rainwater harvesting is the process where the flow of rainwater is diverted from the terrace or the ground towards a water storage tank within the premises, this stored rainwater can be used after basic treatment for cleaning, washing, and for cooking as well as for drinking consumption. Rainwater harvesting is the much needed action which everyone should take on the right time to save the mankind from water scarcity. Everyone can harvest rainwater in their houses or apartments, factories, schools, and offices to increase water supply and improve water quality. 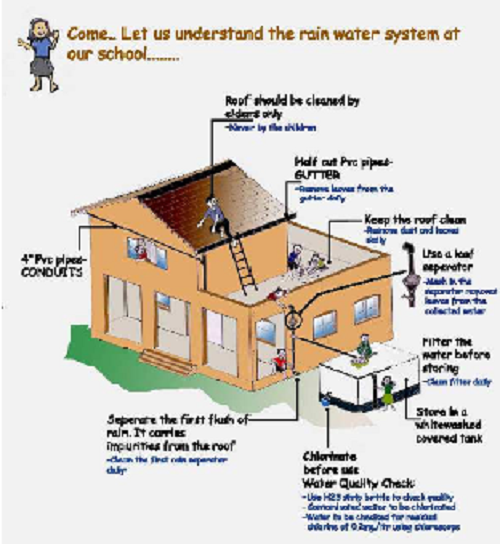 Catchment: Any surface can act as the catchment for rainwater harvesting but the Rooftops are the most favorable. You can collect water from paved areas, footpaths and roads as these places are also good rainwater runoff generators and if treated well then these areas can also provide good quantity of waste water for use. Conveyance: After finding the suitable catchment you need conveyance which lead this rainwater to your storage tank and for this rooftops rainwater gutters and rainwater down pipes can act as a conveyance systems which should be designed carefully so that you do not lose any water during the conveyance process. Storage: The most important part of rainwater harvesting system, it is the place where you store the collected water for further use. A simple ground level tank, underground storage tank (UST), surface lined ponds and large lakes storage can be used for this purpose. -	First choose a right place to install rainwater harvester and the most suitable place is next to the downspout (roof drain pipe) where most of the water from your roof is diverted. Clean the roof; remove all dirt and other useless material from the roof. -	Fix the PVC gutters to the roof or to the walls with clamps slope in the direction of the storage tank. These PVC gutters will collect the rainwater from the roof and transfer it to the filter. Ensure that the PVC gutters must have end cap where rainwater begins to flow in the direction of the tank. -	Now fix PVC downpipes with the help of clamps to the wall firmly which bring the water from the rainwater gutters or pipes vertically down. Do not forget to check these downpipes so that they remain fixed on their place. -	Install first rain separator or a washout pipe, it is a valve which is used at the time of cleaning the roof or when rainwater is not to be collected. Clean it after every rain so that the waste water allowed flowing out. -	Install a filter on top of the storage tank which prevents dust, leaves and other organic matter from entering the storage to keep rainwater in the storage tank clean. -	Now it's time to level the ground where you'll place your storage tank. Place the storage tank on a platform above the ground and paint it with white color to keep the water inside cool and prevent the growth of bacteria. Cover the tank opening with concrete slabs or any local stone. -	Always install overflow pipe on top of the tank which allow the excess rainwater to be safely disposed from the tank which should be equal to the size of storage tank inlet pipe and have a mesh at the bottom to prevent small animals or insects from coming in. -	Always install a tap or hand pump in storage tank to draw the rainwater out for your household purposes. Rainwater harvesting is not very costly as you can find its fitting at home or can purchase them from the market at very low prices. It requires commonly used equipments such as PVC pipes and storage tanks and the cost would depend on the type and length of the PVC pipes. Labor and local expertise charges will be extra. Typically, installing a water harvesting system in a building would cost between Rs 2,000 to 30,000 for buildings of about 300 sq. m. But it is a onetime investment which pays lot in terms of water saving and cut your water bill also.